I love everything about this recipe. It’s such a great and low-carb alternative to pizza. It’s also extremely versatile because it can be used as a first course, a main course, or a side dish! I first introduced this to my carb-loving husband when I was trying to cook healthier for our family and also wanted more ideas for vegetarian dishes. I could tell he was skeptical at first but now it’s one of his favorites! And I always feel good about making and serving it. As Julia would say, “Bon appetit!” (or, I guess in this case, “Buon appetito!”). Sprinkle both sides of the eggplant slices generously with salt. Place in a single layer on paper towels lining a large rimmed baking sheet; let stand 30 minutes to allow slices to release moisture. Heat 1 tablespoon of the olive oil in a large saucepan over medium. Add the onion, and cook, stirring occasionally, until tender, 5 to 7 minutes. Add the garlic and 1 teaspoon of the Italian seasoning, and cook 1 more minute. Add the tomatoes, red pepper, butter, and sugar, if desired. Cook over medium-low, stirring occasionally with a wooden spoon, about 30 minutes. Let cool slightly. Wipe the eggplant slices to remove excess salt. Discard the paper towels and lightly grease the baking sheet. Brush the eggplant with the remaining 2 tablespoons olive oil. Sprinkle with the remaining 1 teaspoon Italian seasoning. Bake 20 minutes or until done but not mushy. Carefully remove the baking sheet from the oven using oven mitts. 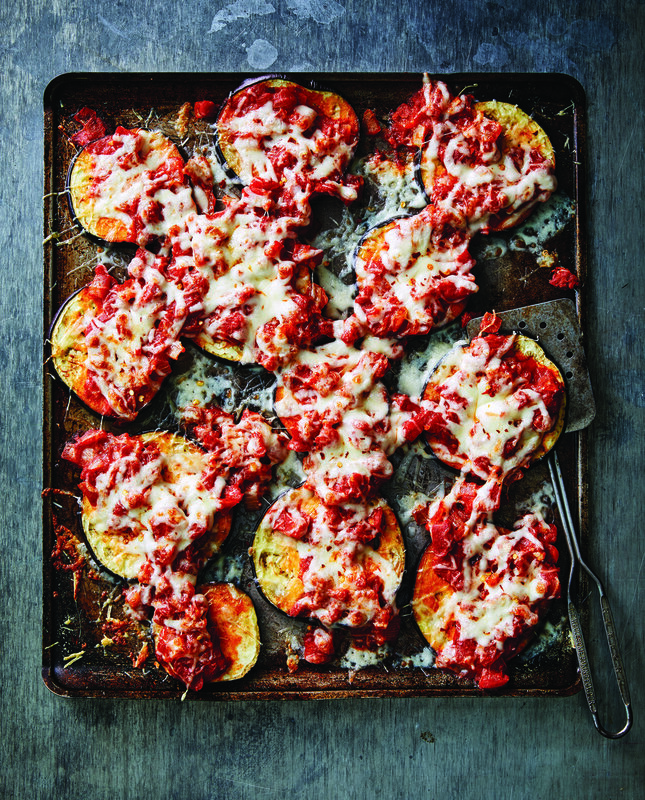 Spread the tomato sauce evenly over the eggplant slices. Top evenly with the Parmesan and mozzarella. Return the baking sheet to the oven and broil 6 inches from the heat for 3 to 4 minutes or just until the cheese is melted. Sprinkle with the basil and additional red pepper, if desired.